The premise of this story was so intriguing, I just couldn't resist. I'm a sucker for family secrets, and for adopted children looking for their families. I also like happy endings. 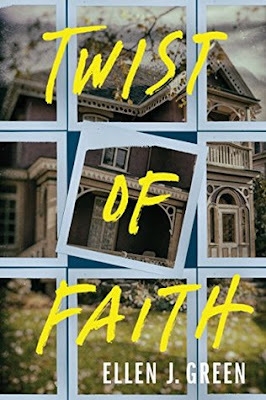 "Twist of Faith" gave me two out of three. It didn't have a happy ending but then a happy ending wouldn't really have worked; it would have been a gyp. The ending we did get, whoa. I did not see it coming, and it leaves open the possibility of a sequel. This story had so many twists and turns that I was at risk of whiplash. Green kept me on my toes. I had to pay attention; it wasn't a book I could read while also watching TV. Not all of it was believable, it definitely stretched credibility, but it was gripping. I read it in one day. The story is told from several different POVs which adds to the suspense. You think you know what's going on and then the scene shifts and bam! You see events or facts in a different way. Green sprinkled hints and clues and red herrings, and made you think and speculate. Actions have consequences and ripples and you can't always predict them. Some of the characters fell flat, were one dimensional. Others, I never knew what to expect. Just when I thought I knew them, they surprised me. Part of me wishes we'd gotten to know Ava better. We do spend some time in her head but then we hop around to other characters. That said, she was an unreliable narrator; actually, there were a couple of those. The head hopping and unreliability added to the tension and the mystery, but also distanced the characters from the reader. It was the story itself that kept me reading, the search for answers, both mine and that of the characters. The story moves at a steady pace, blending action, drama, conspiracies, and a hint of romance into a compelling and twisty story. It's dark and often gritty, not a light read. "Twist of Faith" was a fascinating story full of details and surprises. While not perfect, it was gripping and entertaining. I kind of like that there wasn't a happy ending for this one. I haven't read it but I find it refreshing because after something terrible there isn't always a happy ending in real life. I love psychological thrillers so I'm going to see if my library will be getting this in. A happy ending would have weakened the story so I'm glad the author resisted temptation. This one is on my read list. Thanks for the review! This sounds good despite the flaws! I think I just saw this on my library's audio site so I think I'm going to get on the wait list. Ooo, let me know how you like it.